(PROUT Globe, June 2013) – The gap between haves and have-nots in the Unites States is now so unhinged that researchers find it difficult to fit it with that of other developed nations. A new report from the International Labour Organization shows that U.S. inequality has literally gone off the chart, TruthOut reports. “Income inequality in the United States is soaring so high, in fact, that the authors of the ILO’s new 2013 World of Work report couldn’t even place the United States on the same graph with the other 25 developed countries their new study examines,” the agency writes. The last time income inequality in America rose to such heights was at the time of the Great Depression, noted a 2010 U.S. Senate report. The report suggested that high levels of income inequality may precipitate economic crises, and that income inequality may be part of the root cause of the 2008 Great Recession. 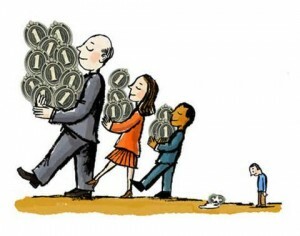 See an informative video on the present income inequality in the U.S. In its effort for creating a dynamic and just economy, PROUT focuses on the surplus available to society after the minimum necessities have been supplied to all. By fixing both a ceiling for maximum salary and private property, as well as a minimum wage, a surplus will be available for further distribution to the meritorious. This factor, the allocation of incentives for further dynamics among the meritorious after first having secured basic necessities for all, is called atiriktam in the PROUT system. “For long, economic efficiency and fairness have been regarded as two separate issues. Many have argued that economists should not even consider equity at all,” notes a recent book on PROUT, After Capitalism, Economic Democracy in Action. At present in America, inequality is not only “off the chart” but still rising. Income inequality in the U.S. rose during the recession of 2008-2009, and continued rising through the lackluster recovery of 2010-2011.